Wow, that is absolutely stunning! What is it? It really is! It’s the arches inside the Prophet’s mosque in Madinah, Saudi Arabia. Breathtakingly beautiful architecture! That is an amazing piece of architecture, so beautiful and intricate! I agree! Its the arches inside the mosque in Madinah, Saudi Arabia. So beautiful!! It really looks so gorgeous! Thanks for stopping by! ? Wow, stunning architecture, the detail is gorgeous. Love the gold at the top of the pillars. Where is it? It truly is breathtakingly beautiful. This was taken inside the Prophet’s mosque in Madinah, Saudi Arabia. My eyes are drawn in different directions. So much to see. Stunning. True, there is so much to see! This was taken inside the Prophet’s mosque in Madinah, Saudi Arabia. Thank you for hosting! This was taken inside the Prophet’s mosque in Madinah, Saudi Arabia. I agree! Isn’t it so regal! This was taken inside the Prophet’s mosque in Madinah, Saudi Arabia. It really is stunning! This was taken inside the Prophet’s mosque in Madinah, Saudi Arabia. It really was breath taking, and you’re right, sometimes you need to see things in person to truly appreciate it. Haha for once, its not actually Dubai! Though, I’ve definitely seen more extravagant architecture here. This was taken inside the Prophet’s mosque in Madinah, Saudi Arabia. Haha yes, this photo was taken inside the Prophet’s Mosque in Madinah, Saudi Arabia. So beautiful! Yes, this photo was taken inside the Prophet’s Mosque in Madinah, Saudi Arabia. Truly beautiful! Yes, uts gorgeous isn’t it! Thanks for stopping by! Oo yes it reminded me of that too, although I have only seen it in photos. 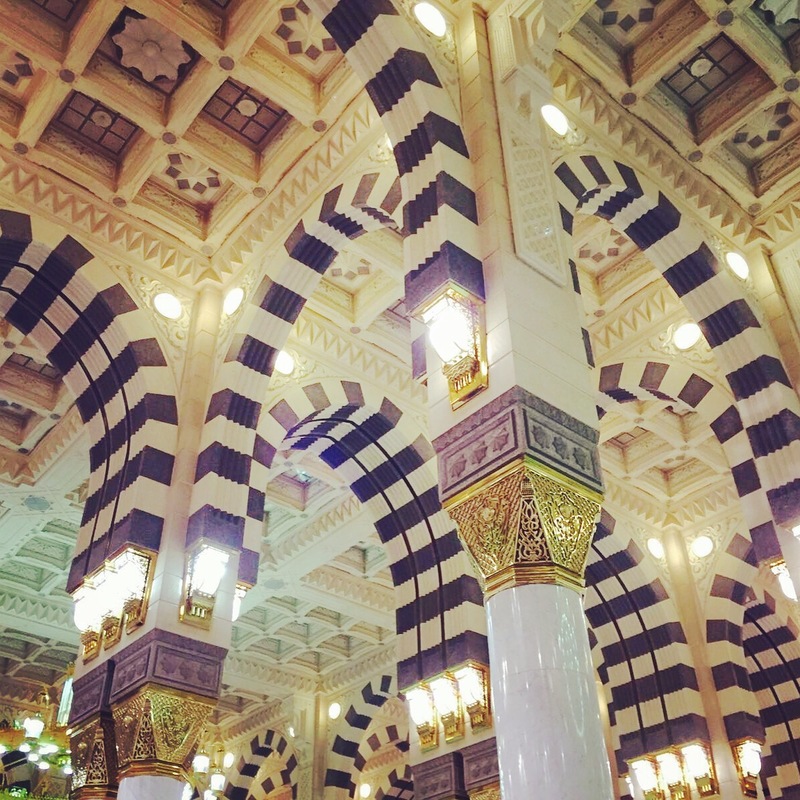 This photo was taken in the Prophet’s mosque in Madinah and it truly looks even more beautiful in person! It really is gorgeous to look at! Thanks for stopping by! ?